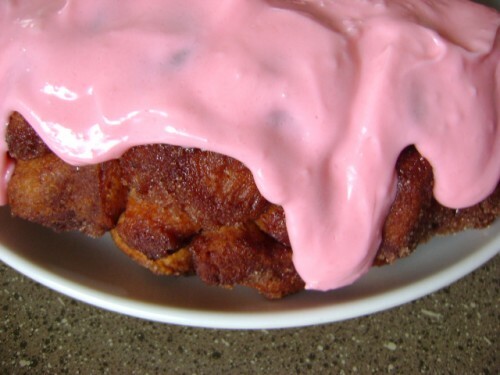 Need something quick and easy for Easter morning breakfast? 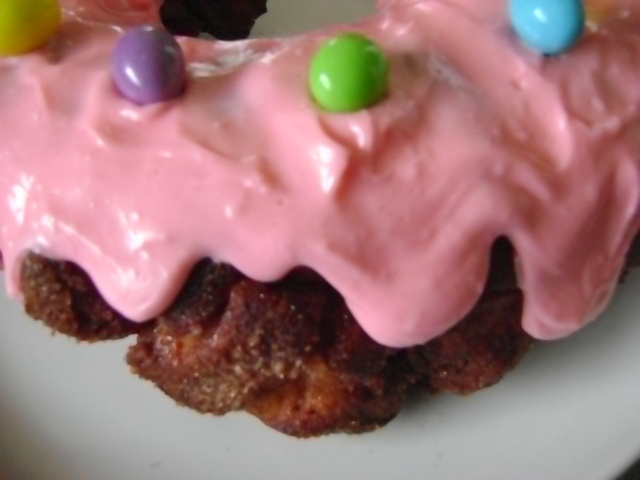 This is a good easy sweetbread that they kids can even help you make.That is if your not squeamish about the mixture of dough, butter, cinnamon sugar and little people. One word of advice though…do eat some of the hard boiled eggs first, or you’ll never leave room. This little thing is mighty tasty, and once you start…it will be hard to stop! 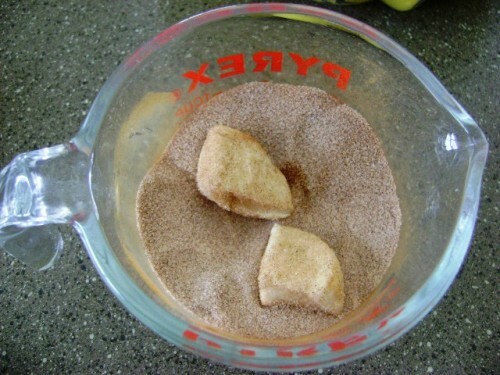 MIX granulated sugar and cinnamon in medium bowl. 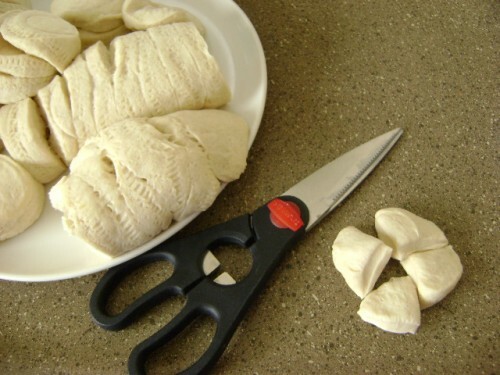 Add dough quarters, in batches; toss to coat. PLACE 1/2 the biscuit pieces in greased 12-cup fluted tube pan; drizzle with 1/2 the butter. Repeat. Sprinkle with any remaining cinnamon-sugar. Bake 40 to 45 min. or until toothpick inserted near center comes out clean and top is golden brown. Cool in pan 5 min. ; invert onto serving plate. Remove pan. 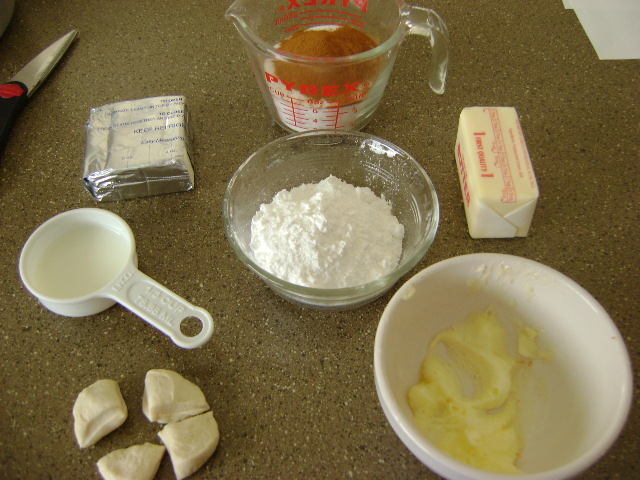 BEAT cream cheese and powdered sugar in small bowl with mixer until well blended. Add 1 Tbsp. milk and a few drops of food coloring; beat until well blended. Blend in enough of the remaining milk until glaze is of desired consistency. Drizzle over warm bread. Feed it to the baby birds. PLACE ½ the biscuit pieces in greased 12-cup fluted tube pan; drizzle with ½ the butter. Repeat. Sprinkle with any remaining cinnamon-sugar. Bake 40 to 45 min. or until toothpick inserted near center comes out clean and top is golden brown. Cool in pan 5 min. ; invert onto serving plate. Remove pan. Place ½ the biscuit pieces in greased 12-cup fluted tube pan; drizzle with ½ the butter. Repeat. Sprinkle with any remaining cinnamon-sugar. Bake 40 to 45 min. or until toothpick inserted near center comes out clean and top is golden brown. Cool in pan 5 min. ; invert onto serving plate. Beat cream cheese and powdered sugar in small bowl with mixer until well blended. Add 1 Tbsp. milk and a few drops of food coloring; beat until well blended. Blend in enough of the remaining milk until glaze is of desired consistency. I thought it was good. That’s a cute picture of Beck! SOOO cute! 🙂 I think this is yummy… I have a special place in my heart for cinnamon! Previous PostPrevious The Chicken or the Egg?